Crown Audio’s DSi 4000 Series Amplifier is designed to work in conjunction with JBL ScreenArray loudspeakers and features automatic presets for JBL cinema speaker systems for quick and easy setup. An intuitive LCD front panel guides installers through the process of choosing loudspeaker signal processing presets and other system parameters. Crown Audio’s DSi 4000 Series Amplifier is designed to work in conjunction with JBL ScreenArray loudspeakers and features automatic presets for JBL cinema speaker systems for quick and easy setup. An intuitive LCD front panel guides installers through the process of choosing loudspeaker signal processing presets and other system parameters. All DSi series amplifiers can be configured through the Harman HiQnet System Architect communications protocol. 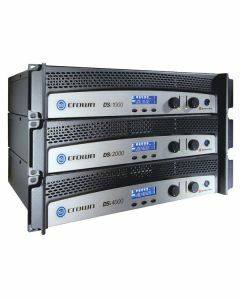 The DSi 4000 amplifiers include Crown’s light and efficient switch-mode power supply and weigh in at 24 lbs. The DSi 4000 has a three-year, no-fault warranty. The power rating for the new DSi 4000 is 1200 watts per channel at 4 ohms. The DSi Series of power amplifiers provides onboard DSP including crossovers, EQ filters, delay and output limiting. All DSi amplifiers are THX certified.